Sugar in the gas tank is one of those staples of miserable things you always heard that awful people do to other, often similarly awful people’s cars. 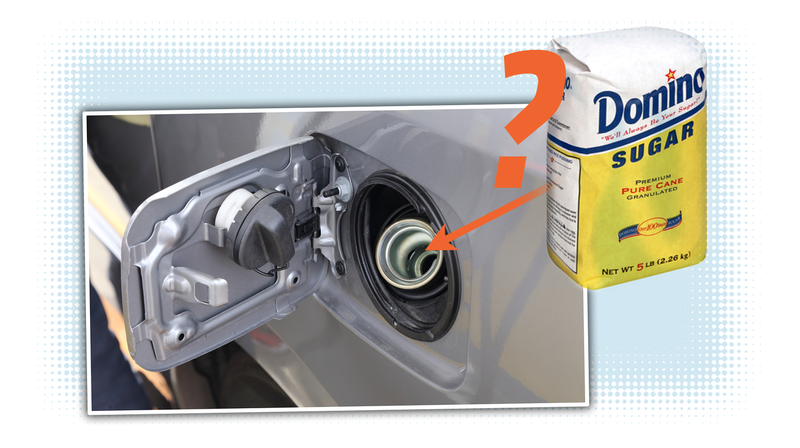 While nobody thinks sweeting your car’s gas is a good idea, the actual results of putting sugar in a gas tank isn’t all that well known. That’s why it’s nice to see someone actually give it a try, and evaluate exactly what happens. The engine-ruiners over at Project Farm made a sweet-gas mixture for their test gasoline engine, in this case a lawnmower engine, ran the sugar-gas mixture through the engine, then removed the cylinder head and did some basic tests to see the results. While perhaps doing the test on a full-size modern car engine may have been more exciting, that’s an awful lot of commitment, and, really, a four-stroke lawnmower engine should show the same basic results as a larger automotive engine. The results are interesting, but not really surprising. The engine doesn’t explode or fail in any dramatic way, or even at all, really. The performance does get degraded a bit thanks to the caramelized sugar on the piston, valves, cylinder head, and pretty much everywhere. Longer-term, this will absolutely be an issue, possibly a delicious, creme brulée-tasting one. I wonder if modern fuel-injected engines would experience more trouble running on a sugar-gas mixture than this crude carbureted lawnmower, too? I suspect that’s likely. The upshot is, of course, like you’d expect, it’s no good. It’s just nice to see exactly why.